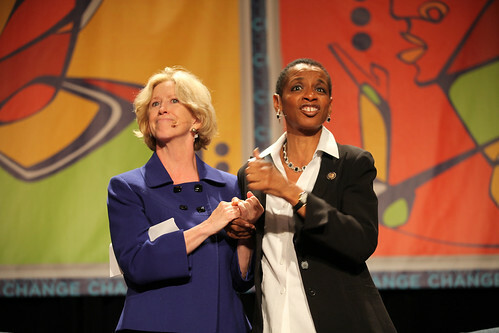 NPR’s Moira Gunn and Rep. Donna Edwards, D-Md., at the end of their chat at 2011 NTC. Here’s my Flickr photo set from the Nonprofit Technology Conference held Thursday to Saturday in Washington, D.C. at the Washington Hilton — 89 photos in all. I got a chance to try out my new Canon 5D Mark II and 70-200mm lens. It was the biggest (2,008 attendees, founder Holly Ross announced) and best NTC yet. I’ll be writing several posts over the coming days and weeks about some of the highlights. I snagged video interviews with Mark Horvath of Invisiblepeople.tv, Jonathan Greenblatt of AllforGood and Ramya Raghavan of YouTube. • David Neff, Help Attack! JD: I am so jealous of your list of people you got to meet at NTEN! I so wish I could have been there this year – but it was just bad timing with another event I needed to be at. I would love to have met you and others. By the way, Tim Lim from Change.org is a really great guy. I've known him for a while. He's a master connector! I have been told several times I need to meet Charlotte Radamaekers, Heidi Massey, and Amy Bastian. I think it was a fantastic idea for you to put together this list – I wish you lots of success with all of your connections!